Playing the role of docent as well as conductor, Christopher Wilkins introduced the evening with the caveat that art and music occupy parallel universes. Having conceived of a program of music inspired by art, Wilkins took pains to separate the two art forms, projecting images before playing each musical work. Burchfield’s fantastic nature paintings were the impetus for Gould’s seven-movement Burchfield Gallery. After Wilkins’ introduction, the Akron Symphony played five of them under the direction of associate conductor Eric Benjamin. For the Prologue, Gould fashioned a passacaglia based on the artist’s initials (C-E-B), introduced by the basses and answered by pointillistic gestures in the orchestra. “Spring—Ballad” is effervescent with brass. “Brookside Music—Interlude” features conversations between winds and percussion, ending with solo harp. “Autumn—Scherzo” is busy with solo winds. The suite ends with “The Four Seasons—Fantasy,” named after the Burchfield painting where all four seasons are represented at once. A wind machine, castanets, and maracas come into play, and like Vivaldi’s The Four Seasons, the suite ends with icy references to winter. Gould’s suite is engaging and accessible, and if its musical content isn’t always of the highest order, the composer’s ear for orchestral color is always in evidence. So is his memory for other composers’ music — at one point, an orchestral ostinato strongly resembles the end of Sibelius’ Fifth Symphony. Benjamin and the Orchestra gave the suite a dashing, committed reading. Wilkins introduced Paul Hindemith’s Symphony: Mathis der Maler with a detailed look at Grünewald’s masterpiece, an altar commissioned by the Church of St. Anthony in Isenheim, Alsace. 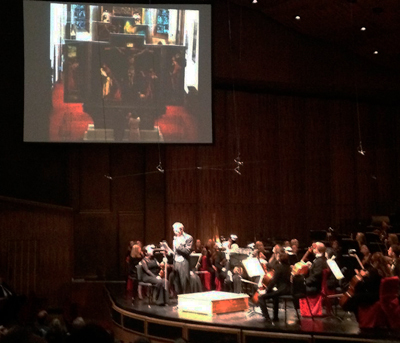 Hindemith chose three aspects of that altarpiece to explore in luminous symphonic treatment. “Engelkonzert,” a movement that invokes a folk song played by the trombones, represents the angels (one of them may be Lucifer!) who serenade the Madonna and Child. “Grablegung” references Grünewald’s depiction of the entombment of Jesus with tender wind solos. “Versuchung des heiligen Antonius” represents the gory Temptation of St. Anthony in music resplendent with brass. Wilkins — conducting from memory — and the Orchestra gave the Symphony a spacious, sonorous performance sometimes dominated by the brass, who have a natural acoustic advantage over strings and winds in the hall. An annoying technical glitch kept showing slides of the evening’s titles and ASO’s coming events on the screens well into the Angel Concert. Wilkins’ introduction to Mussorgsky’s Pictures at an Exhibition was necessarily briefer than the others because not all of the drawings and paintings in Hartmann’s famous 1874 show have survived — just enough to give a taste of the artist’s quirky and sometimes bizarre tastes. The image of the Ballet of Chicks in their Shells drew a laugh from the audience, and the clock in the form of the Russian witch Baba Yaga’s Hut on Fowl’s Legs seemed to inspire a little shiver. Again conducting from memory, Christopher Wilkins led a spirited performance of Ravel’s orchestration of Mussorgsky’s piano suite. Fine wind playing abounded, as did a few too many burbles from the brass. All ended splendidly, as it should, at the foot of the Great Gate of Kiev. Published on ClevelandClassical.com November 22, 2017.